To give style power and superior multi-tasking in affordable price, Intex has launched it’s Octa-core budget smartphone, the all new Intex Aqua Power HD featuring 5”inch HD display, 13-MP+5-MP Camera, 4,000mAh battery priced At Rs 9,444 in white, black, blue and grey colour option while Intex Aqua Power is avaialble in India priced at Rs. 8,444. 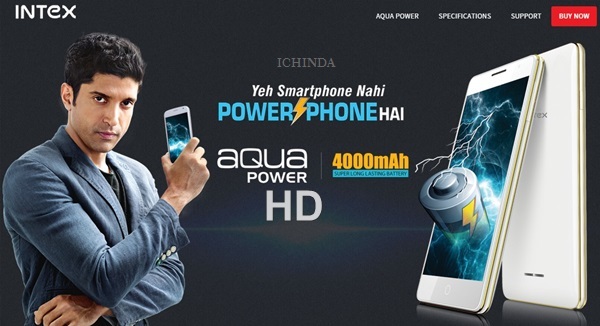 Intex Aqua Power HD will take on Micromax Yu Yureka and Xiaomi Redmi Note. The all new Intex Aqua Power HD offers you a a 5-inch HD display with resolution (720×1280 pixels) and colour depth RGB/16.7m promising crystal clear view from every angle while latest Android 4.4 kitkat OS(Upgradable to Android 5.0 LollyPop) and by a powerful 1.4GHz octa-core MediaTek (MTK6592M) processor capable of revolutionizing your multitasking. Aqua Power’s 2GB RAM, 8GB ROM and 32GB external memory allows you to store your favorite songs, movie and games. Intex Aqua power HD also offers you a 13-MP Primary camera with LED flash with Smart Camera Feature – Image Capture by – Voice, BT headset and Handsfree, Smart Object Tracking which allows you take a photo in low light condition and 5-MP secondary front camera for video calling and selfi. Intex Aqua Power HD is powered by most powerful 4,000mAh battery with Smart features – Fast Charging comes in a dimension at 141×71.9×9.3mm promising Talk Time up to 20 hrs and Standby Time 500 hours. It also supports dual-SIM (GSM+GSM), 3G, GPRS/ EDGE, Wi-Fi 802.11 b/g/n, Micro-USB, and Bluetooth. It’s Power Bank feature by OTG support, Free Replacement on one time breakage of Screen for One Year, Pedometer, Smart Air Shuffle, FM recording, LED flash, Clear motion, E-Compass. Intex AQUA Power HD Rivals Lenovo P780, Micromax Canvas Power, Lenovo S860, Lenovo Vibe Z2 Pro, and Xolo Q3000. At last Few honest word, that all new Intex AQUA Power HD is coming to revolutionize your multi-tasking. What you think? Please be open to give your view. I got Intex aqua power HD in richie street it is 4.4.2 I cant able upgrade it ti 5.0 .please confirm me how I can…..